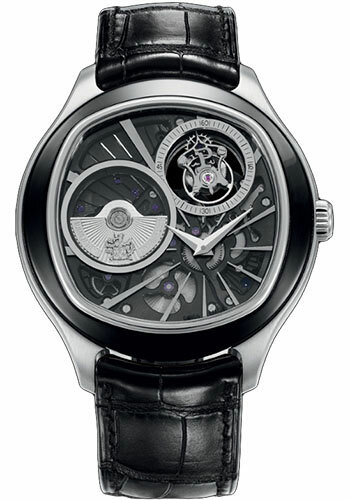 46.5 mm 18K white gold case , cushion shape, 10.4 mm thick, sapphire back, black dial, 1270P automatic movement with hours at 5 o'clock, minutes at 5 o'clock, power reserve indicator, ultra-thin movement, off-centered micro-rotor in gold, flying tourbillon at 1 o'clock and titanium carriage , approximately 40 hours of power reserve, black alligator strap, folding buckle. Water resistant to 03 ATM. 46.5 mm 18K white gold case , cushion shape, 10.4 mm thick, sapphire back, 1270P automatic movement with hours at 5 o'clock, minutes at 5 o'clock, power reserve indicator with ultra-thin movement, off-centered micro-rotor in gold, flying tourbillon at 1 o'clock and titanium carriage, approximately 40 hours of power reserve, black alligator strap, folding buckle. Water resistant to 03 ATM. 46.5 mm 18K rose gold case , cushion shape, 10.4 mm thick, sapphire back, 1270P automatic movement with hours at 5 o'clock, minutes at 5 o'clock, power reserve indicator, ultra-thin movement, off-centered micro-rotor in gold, flying tourbillon at 1 o'clockand Titanium carriage , approximately 40 hours of power reserve, brown alligator strap, folding buckle. Water resistant to 03 ATM. 46.5 mm 18K rose gold case set with 228 cut diamonds (approx. 1.8 ct), 10.4 mm thick, sapphire back with power reserve indicator, set with 10 cut diamonds (approx. 0.2 ct) crown, diamond bezel, 1270P automatic movement with hours at 5 o'clock, minutes at 5 o'clock, power reserve indicator with ultra-thin movement, off-centered micro-rotor in gold, flying tourbillon at 1 o'clock and titanium carriage, approximately 40 hours of power reserve, brown alligator strap, folding buckle. Water resistant to 03 ATM. 46.5 mm 18K white gold case, 8.85 mm thick, sapphire back, 18K white gold bezel, sapphire crystal, caliber 1270S self-winding mechanical movement with off-centered hours and minutes at 5 o'clock, seconds indicated by the carriage at 1 o'clock, approximately 42 hours of power reserve, black alligator strap, folding clasp buckle. Water resistant to 3 atm. 46.5 mm 18K red gold case, 8.85 mm thick, sapphire back, 18K red gold bezel, sapphire crystal, skeleton dial, caliber 1270S self-winding mechanical movement with off-centered hours and minutes at 5 o'clock, seconds indicated by the carriage at 1 o'clock, approximately 42 hours of power reserve, brown alligator strap, folding clasp buckle. Water resistant to 3 atm.